It’s a running joke that the bit characters on Star Trek get killed cheaply, but what do they think about it? Redshirts is the story of the crewmembers on a ship very much like The Enterprise who realize that they’re always the ones to die on missions. They look for an explanation and a way to save themselves. It’s no secret that I dislike John Scalzi’s writing style, but I still had high hopes for this. Redshirts didn’t need to be brilliant, but just the clever, well-structured sci-fi adventure that Scalzi does best. And I assumed that his writing had probably improved over the years. Oh, it’s clever at times. Scalzi takes a metatextual nerd joke and builds a story around it that actually makes sense at times. But the characters are flat and pointless, and the writing usually doesn’t feel right for the content. Redshirts should either be a light farce that doesn’t take its situation seriously, or a psychological horror piece about people who can’t escape the force that is killing them one by one. This dallies in both extremes (some death scenes are played for laughs, while at other times characters betray each other to save themselves), but it usually ends up stuck in an awkward middle. The story is played seriously, but without the pathos it needs. And I’m never given much reason to care about anyone in the book, which makes it awkward when the story stops to give a minor character some growth. Yeah, I get it. Light, funny, sexually-charged banter can be fun. But this scene feels lifted from a C+ paper in a class called “Character Quirks 101”. It’s not just the characters, though. The plot and its resolution, which seemed like another good Scalzi effort at first, eventually go completely off the rails. Redshirts jokes about the nonsensical science in Star Trek-like dramas, which is fair enough. But after establishing the bad science rules, the characters proceed to solve their problems in ways that barely follow from that! Let that sink in: Scalzi presumably meant his writing to rise above the sci-fi hackwork he jokes about, even if it was working in the same system. But instead, he makes fun of those systems, and then proceeds to do a worse job himself. Seriously. One of the most important actions the characters take comes a few pages after they discuss the fact that it wouldn’t work. They don’t find a way around it. One of them just pops up in the next chapter and says “Hey guys, it’s time to do this.” Some major later plot points also don’t follow from the established rules. (I can’t talk about them without spoilers, so I’ll put them below in the comments.) This book is supposed to work because it plays around with sci-fi clichés in clever ways, so it’s a real problem that the cleverness fails after the first hundred pages. Then there’s the rest of the plot. It ends abruptly, with a twist that barely makes sense. It’s then followed by three codas, named (and written in) “First Person”, “Second Person”, and “Third Person”. Each one fleshes out a character who only appeared for brief moments in the main story, giving us closure about something that doesn’t matter at all. And yes, one is written with an irritating second-person point of view, for no discernible reason other than the writing gimmick. The final coda would be a pretty good short story on its own, but in context it just reminds us of the single awkward scene its person appeared in: Witnessing a moment of growth for another character that no one cared about. Yes, I know Redshirts is up for a Hugo award right now. I can’t imagine why. It has an interesting set-up, but it falls apart thanks to flat characters, inconsistent events, and a plot structure that barely even makes sense. Save yourself the effort. For years, I’ve insisted that board games were designed to be played in person, and therefore were generally best that way. But since becoming a father, it’s been a lot harder to find time for in-person gaming. I’ve finally started playing more online, and found that a lot of turn-based games are fun that way. The results are mixed – if there are going to be long delays between turns, it’s generally best to play weightier games where each turn is significant instead of ones where people make frequent simple moves. Today I’m looking at two iPhone board game apps. I’ve found myself with very mixed opinions about iPhone gaming. It is very convenient to have the apps everywhere I go, and to find out it’s my turn through push notifications. On the other hand, Apple’s Game Center is still pretty frustrating. It’s fine for starting games with friends, as long as you know enough people who have iPhones and want to play the game, but it almost always fails if I try to start a game against random opponents. It seems to be at least partly because Game Center looks for people trying to start exactly the same game as you. I may be happy to play a three, four, or five-player game, but I still have to choose one before Apple will match me. It would be nice to know that, for example, there was a four-player game just waiting on one more person to join before it could start up. It’s even worse when the games have multiple set-up options, because whatever you choose has to be matched exactly by someone else or they won’t join your game. For anything with more than two players, it seems that usually by the time the game starts up, at least one player has wandered off and never thinks to check back. At this point, I’m willing to say that Game Center games are good only for friends or playing against a single random opponent. The two games I’m reviewing today are ones that I already know and like in tabletop form. I’m not focusing too much on gameplay here, but rather in how well they provide the same experience in mobile form. Le Havre is a long, complex game that requires a large table and involves a lot of cards with detailed text and symbols. I was curious to see how someone could fit all that into a playable iPhone game, and the answer turns out to be that they couldn’t. They make a valiant effort, with different areas of the board that you can tap to expand. In the normal collapsed view, the cards are “stacked” so that the titles are readable as long as there aren’t too many yet. It even shows everyone’s play areas, with the current player’s given a little more space. All the information is there as long as you tap the right spots to get into it. However, it’s very hard to follow. I’m an ok Le Havre player, but I act like a complete novice in the iPhone app because I don’t notice everything that’s going on. Yes, all the information and actions are there (including a slow-to-page-through log of past turns), but I just can’t take it in on the phone. I’m told that Le Havre is playable on the iPad, and I can believe that. But it’s sold for the iPhone, and that’s what I’m reviewing. In that format, it’s a confusing, unplayable mess. I give them some credit for the complexity of the implementation, but that’s the best praise I have. The physical version of Ticket to Ride is one of the classic “gateway” Euro games, and from what I hear, the app has been just as successful. I think it deserves that. It’s a near-perfect implementation of the board game, with all information fitting neatly on the screen. Your hand goes across the bottom, the cards you can draw from across the side, and your specific “tickets” (missions) down in a corner. You do have to cycle through the tickets one at a time, but that’s rarely necessary because the app automatically highlights every city you need to connect. The view of all required cities is usually all you need to know, unless you’re trying to decide which missions to give up on. Keeping track of those locations on the map yourself can be the most frustrating part of the game, so the app has a big advantage over the tabletop version. Though there’s no log of all past turns, it also does a nice job of displaying everyone’s most recent move in a status bar across the top. That bar also summarizes the number of cards and train tokens players are holding, so everything you could normally need to know is covered at a glance. I can think of several more obscure things I’d like to know: How many wild cards did an opponent use when they built that last track, or at which specific point since I last checked in did the available cards refresh? However, I would rarely use this information. The app’s main flaws are outside of the game. The Game Center hassle goes without saying, and it’s debatable whether Ticket to Ride should be blamed for that. But it’s also difficult to enter and leave your existing games. When looking at a gameboard, the only way to back out to the main screen is a (hard-to-find) button labeled “Quit”, which I was scared to press at first. Then from the home screen, to get back to a game in progress, I have to go through all the steps of setting up a new game, even going as far as the Game Center dialog that looks like I’m going to invite new people! The news items (all ads for Days of Wonder products) can also be annoying, since they add to the count on the app’s icon, making it look like you have games waiting for your move. And you need to scroll all the way to the bottom of the news post to clear it from your count. Still, all these hassles are peripheral to the main experience. 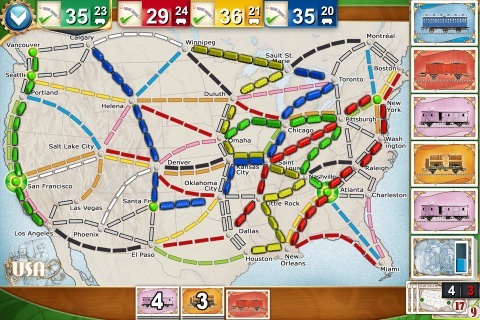 Once you actually get a game going, this feels exactly like playing classic Ticket to Ride. It’s amazing that I was able to fill my time with new games so efficiently that a debut from last Fall’s Essen festival now seems old. Just a few years ago, I remember spending most of my Origins time in the Board Room, because there weren’t enough games around the rest of the convention to hold my attention. And even then, a lot of what I played in the Board Room was a couple years old. Board gaming has really taken off, as well as taken a starring role at Origins. Admittedly, this probably gives me a skewed view of the convention as a whole. Not everyone agrees with my claim that the convention is healthier than ever, and that’s probably because I don’t notice how categories like RPGs and miniatures are fading away. My posts about Origins are admittedly biased towards the subjects I care about. However, I can say that in a short time, board gaming has gone from being an unimportant sideline of Origins to the main point. I don’t know whether it will be enough to keep the show going if everything else dries up, but I definitely hope so. This is an incredible event if you’re a board gamer. And now, onto my first impressions of games. To follow up on my general impressions of Origins 2013, here are the specifics about the games I played. I didn’t feel like I got a good handle on which games had “buzz” this year. Maybe it’s because I was running around from game to game so quickly, or maybe it’s because there were so many new, big releases that the board gamer buzz tied closely to what the community already knew to look for. Either way, I don’t think I can sort my games by buzz-level this year like I normally do. Instead, I’m splitting them up by how new they are. So many of them were brand new that if I just separate the Origins debuts from the ones that came out a few months ago, that divides my list pretty neatly in two. So today I’m going to cover the Origins debuts and upcoming games, and in a couple days I’ll look at the “older” titles. I’m only looking at games’ US availability here. They almost all come out in Europe sooner, but I’m a US gamer, Origins is a US conference, and I think it’s fair to look at them that way. Also, as usual, I don’t want to give “formal” reviews for a game that I played once in a convention atmosphere. Instead of my usual letter grades, I’m using a 1-10 rating.